SES, a new addition to the NMLS platform, will be an exam management system created by state regulators for state regulators and the companies they supervise. It aims to facilitate the exchange of data and documentation, as well as all other aspects of the examination workflow. As a full-service examination management system, SES will support nonbank and depository examinations. With SES, state agencies will be able to share the data and records needed within an efficient multi-state process, while keeping certain records confidential. 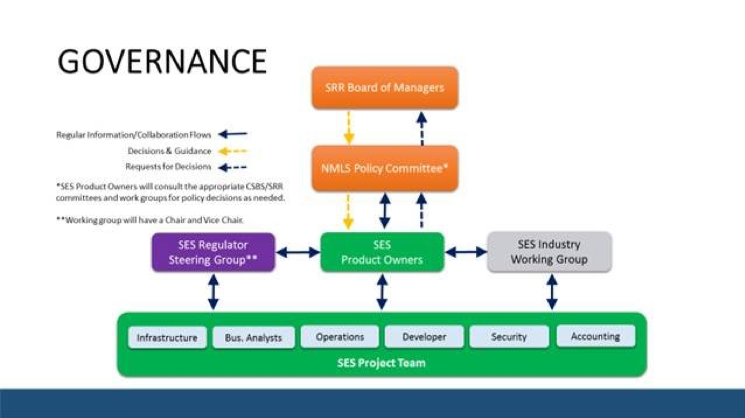 The SRR Board of Managers will direct and oversee the development of the SES platform. CSBS will develop the software platform through extensive regulator and industry stakeholder engagement to ensure end user satisfaction.